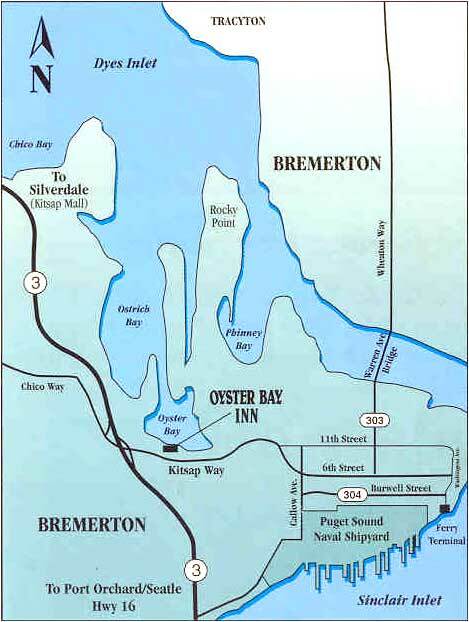 The Oyster Bay Inn is in close proximity to the Kitsap Mall, and minutes from Puget Sound Naval Ship Yard, the Bremerton / Seattle Ferry and Downtown business district. Only 50 miles from the Seattle International Airport, the Oyster Bay Inn is convenient to a variety of activities and attractions on the Kitsap Peninsula. Follow signs to Hwy 5 south. Exit Hwy 16 to Bremerton. Follow Hwy 16 over the Tacoma Narrows Bridge towards Gig harbor / Port Orchard, until it turns into Hwy 3 (Gorst). Continue on Hwy 3 north, exit Kitsap Way, turn right and proceed approximately 0.25 miles to the Oyster Bay Inn found on the left side of the street. Follow Washington Ave. north to 6th Street, turn left and follow 6th Street which turns into Kitsap Way at Callow Ave. Proceed on Kitsap Way approximately 1.5 miles to the Oyster Bay Inn found on the right side of the street. Follow Hwy 305 to Hwy 3 south, exit Kitsap Way, turn left at the light and proceed approximately 0.25 miles to the Oyster Bay Inn found on the left side of the street.